This Spooky Marion update concerns a couple of stories I have lying around that aren’t really long enough to warrant their own posts, but I think you’ll still find them interesting reading. Is there anything lower than graveyard vandalism? For anyone who’s ever lost a loved one, we like to think that their final resting place will be, well, peaceful. That was not the case for the Wyatt Cemetery during the summer of 1969. The Marion Star reported that young people (presumably) had been using the site as a party spot that summer and had toppled many of the tombstones. 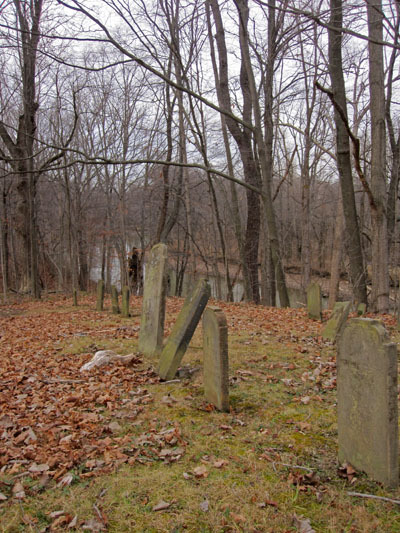 The Wyatt Cemetery with the Olentangy River in the background. Fort Morrow is long gone, of course, but the cemetery bearing Nathaniel Wyatt’s name remains. 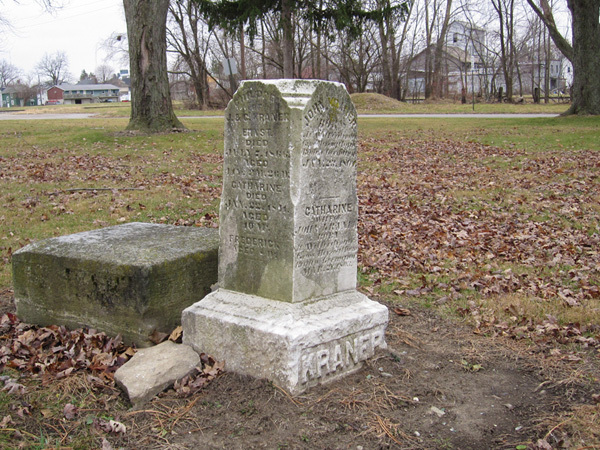 Located just south of Waldo and next to the Olentangy River, Wyatt Cemetery is actually the oldest cemetery in Marion County. It’s historically important as well since it’s near the site of an old military outpost, Fort Morrow. Still, it’s surprising how many people in Marion County have never heard of it. In 1806, Nathaniel Wyatt and his brother-in-law, Nathaniel Brundige, brought their families to settle in what is now Waldo Township. They were the first white settlers in what would become Marion County. When one of Mr. Wyatt’s children died in 1808, he buried her on a bluff overlooking the Olentangy River, and thus the cemetery began. In addition to the many members of the Wyatt and Brundige families buried in the Wyatt Cemetery, the remains of 13 unknown soldiers who died while fighting in the War of 1812 are buried there as well. Just a few years later, on July 10, 1972, the Star again ran a story detailing how “unthinking vandals” had damaged and even toppled many of the tombstones. The headline from the July 10, 1972, edition of The Marion Star. The article noted that some of the 1969 vandals were eventually caught and served some time in jail over the vandlism. A lot of those young people who vandalized the Wyatt Cemetery are probably in their late 60s today. I suspect they wouldn’t be as thoughtless about toppling a tombstone now that they’re a lot closer to having one with their own name on it. The (misspelled) headline for the January 10th, 1918, edition of The Marion Daily Star. And in the Bible, a passage from the Book of Revelation 6:12-13 (“And when I saw the Lamb open the sixth seal, there was a great earthquake, and the sun became black like sackcloth of goat hair, and the whole moon turned blood red, and the stars of the sky fell to the earth…”) implies that meteors (i.e. falling stars) will be part of the Great Tribulation. 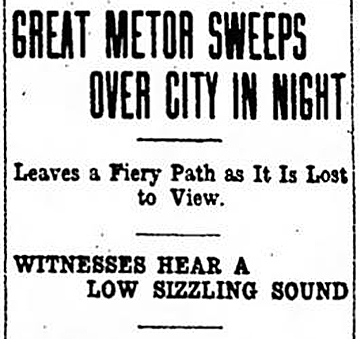 Unsurpsingly, then, when a meteor streaked through the sky over Marion in the winter of 1918, it caused quite a stir. The Marion Daily Star reported that people around town were awoken by a loud explosion that shook their houses shortly after midnight on January 10th. Although residents tried to locate the spot where the meteor landed, they were unsuccessful. In all likelihood, the meteor burned up in the atmosphere before it reached the ground. Was that a Ghost I Happened Upon? While I was putting together a chapter on the Quarry Street Cemetery for Haunted Marion, Ohio, I ran across this letter to the editor written by Marion resident Donald Moore and published in The Marion Star on November 13, 2010. In the end, although I didn’t include it in the book, I still think the story he tells is quite charming. [This is an] incident which happened to me in 1935 when I was 14 years old and lived on East George Street, east of Greenwood Street, opposite the old Huber plant. I was skinny as a rail and also a book worm, both of which contributed to my story. I had walked to the library on South Main Street and was returning home after dark. I walked down Quarry Street beside the cemetery, and being more foolish than brave, I decided to cut across the center of the cemetery toward a short north and south alley that ended at the north edge of the cemetery. One of the few remaining grave markers in the Quarry Street Cemetery. For some reason, about halfway through the cemetery, I started running. So, there is a teenager having second thoughts about going through a cemetery after dark. I really wasn’t spooked. I just decided to cross this area in a little less time. So, I was moving pretty good as I approached the north edge of this quiet, dark area. As I came to the alley area, I spotted two strands of a wire fence blocking my approach to the alley about a foot off the ground. At my modest speed it was no problem to jump over the law fence. As my feet hit the ground, something grabbed me about the waist, and I was pulled backward into the dark cemetery. If my hair ever stood on end, that was the time. I tried to get my speed up and got nowhere. When my heart slowed down a bit and my brain started working again, I discovered that there was a third strand of wire, waist high, that I hadn’t seen in the darkness and it had caught me as my feet hit the ground and lifted me backward to the same spot I had just departed from. You might ask have I any objection to going into cemeteries? No, not on a bright sunny day. At night? Forget it! At one time in my youth, I was more foolish than brave. Now I am neither foolish nor brave. Count me out.